If you’re brave enough to make mathematics your life’s work, your interest can lead you to an exciting future in fields like education, analytics, statistics, and more. Earn your Bachelor of Science in Mathematics online at Maryville, and you can work toward a versatile degree that can give you the foundational, theoretical, and practical mathematics skills to pursue further education or begin your career. Our program allows you to choose from a wide array of electives in topics like discrete mathematics, optimization, advanced calculus, financial mathematics, and statistical modeling. You also can earn your minor in data science so you can use your analytical knowledge to break into new fields of mathematics. Why earn your online B.S. in Mathematics? Earn your online B.S. in Mathematics, and you can progress through a versatile degree program that helps you choose your future. Want to be a data analyst who drives success in business? How about a high school teacher who works to inspire the next generation of mathematicians? At Maryville, you can develop broad math expertise to become a stronger authority in your desired field. Here, you can personalize your online mathematics degree to fit your goals as you make connections between different branches of mathematics. Our program is designed to include a minor in data science, so you can develop the skills to make math your business as an analyst. Our wide range of electives allows you to further customize your experience by studying mathematics topics relevant to scientists, educators, financial experts, and more. Your online mathematics degree can provide a general path to pursue diverse opportunities, including roles in education, technology firms, private enterprise, and government agencies. Graduates can emerge prepared to provide expert analysis that can make you a valued asset across an array of fields and organizations. Expand your career preparation. Select career-focused electives, earn your minor in data science, and complete an optional internship. Engage with our supportive, industry-connected faculty. Align your career goals with a curriculum designed for real-world application. Financial aid. Apply to be considered for financial aid. At Maryville University, your math major can be shaped to help you pursue different types of mathematics careers, with minors and electives to help you focus on applied statistics, data science, and more. It’s a personalized program that can prepare you for opportunities as a teacher, analyst, actuary, statistician, and other roles where data analysis expertise is valued in diverse fields. The average starting salary for mathematics majors is $47,000 — with room for rapid growth. Your bachelor’s in mathematics can ultimately help you qualify for positions where average salaries can exceed $100,000. While compensation varies depending on factors like experience and location, many math-related positions have steady to high median pay, including high school teachers ($59,170), actuaries ($101,560), mathematicians/statisticians ($103,010), operations research analysts in the federal government ($111,570), and data scientists ($114,520). Demand for data analysis in many fields is driving higher-than-average projected job growth for many mathematics roles, including mathematician/statistician (34%), operations research analyst (27%), data scientist (19%), and math teacher (8%). The U.S. Department of Education aims to increase the number of STEM educators nationwide. It’s a top priority. However, the U.S. Bureau of Labor Statistics reports that qualified math teachers are extremely hard to find, especially at the high school level. You can help solve this problem. Personalize your bachelor’s in math and become the teacher our country needs. Why choose Maryville University’s online mathematics degree program? When you choose Maryville’s online B.S in Mathematics, you can develop mathematical and analytical skills to begin or advance your career. It’s a flexible online program that provides a broad foundation with the opportunity to study advanced concepts and choose electives to tailor your educational experience to fit your goals. Our program is designed to help you stand out in the job market with your minor in data science. Data science coursework gives you the opportunity to learn future-focused concepts like machine learning and to develop foundational skills in coding, so you can use your mathematics insights to pursue exciting, high-tech careers in data and analysis. The online mathematics degree was developed to help you graduate with extensive mathematics expertise that can serve as the core of your career or your next degree. Access all of your courses 100% online through our easy-to-use online learning platform, and connect to our faculty members, who can help you apply your coursework to a range of career goals. Maryville University was founded in 1872 and has been training motivated professionals with industry expertise ever since. Ninety percent of our full-time faculty members hold a doctorate or terminal degree. We’re proud of our reputation for quality academics and affordability, because it demonstrates our devotion to helping students like you advance with confidence. Learn from experienced math mentors. 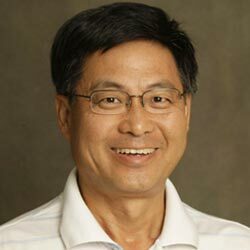 Guangwei Fan is a professor and leader of Maryville’s mathematics program, serving as an educator at the university for nearly 30 years. He is a recognized authority on mathematics, with many published works as both researcher and reviewer in international professional and academic journals. In his research, Fan looks for ways to expand how mathematicians function in organizations around the world. He brings this same sensibility into his courses, helping math students build relevant career skills through coursework and projects. With his help, you can better analyze information and communicate your findings in a wide range of business settings. At Maryville, you can take courses in mathematics and actuarial science with Fan and benefit from his long history of steering students through diverse, complex theories. He can help you learn to apply your choice of math courses to pursue a focused career in education, data analytics, statistics, actuarial science, and other fields. The online Bachelor of Science in Mathematics comprises 128 credit hours, including your mathematics major, general education, and electives. Mathematics core (34 credits): Build your college-level math foundation and advance your understanding with coursework in calculus, number theory, linear algebra and differential equations, probability, and the history of mathematics. Data Science Minor (18 Credits): Our program is designed with a built-in data science minor to help you develop digital skills to pursue high-tech careers in coding, machine learning, and more. These six courses include foundational coursework in data science; mathematical modeling; machine learning; and coding in R, Python, and SQL. Math Electives: Further specialize and enhance your math degree by choosing courses relevant to your personal interests and career goals. Options include coursework in mathematics for scientists, optimization, discrete mathematics, statistics, predictive modeling, financial mathematics, and many more. Your online mathematics degree can be personalized to help you pivot or advance your career in applied statistics, data analytics, or education. As a graduate, you can emerge prepared to brave the worlds of mathematics, statistics, modeling, and more with sharp analytical thinking that can lead to solutions. Your mathematics major can lead you to roles where your expertise is key to organizational success. As you advance as a leader in the field, you may seek a master’s degree that can complement your bachelor’s in mathematics. At Maryville University, you can expand your math studies with online graduate degrees in business data analytics, business administration, software development, and more. Master of Science in Data Science, which allows you to build on your mathematics knowledge by studying concepts like machine learning, statistics, artificial intelligence, business, and more. Master of Science in Business Data Analytics, with advanced courses in data visualization, database principles, and predictive modeling. Master of Business Administration, with your choice of nine in-demand concentrations, including project management, financial services, and information technology. Master of Science in Software Development, with a unique blend of coding and management courses and no business experience required. Learn more about the online bachelor’s in mathematics at Maryville University. Get a head start on your master’s with Early Access. When you earn your undergraduate degree at Maryville, you can take advantage of our Early Access program to get started early on your master’s degree. If you have a GPA of 3.25 or better and you’ve completed 90 credit hours or more, you may be eligible to get a head start on the degrees listed above and more through Early Access. During the last leg of your undergraduate degree, Early Access allows you to earn up to 12 credits toward your master’s degree. To learn more about Early Access, or to find out if you’re eligible, contact your academic advisor.